Frozen water is not just a physical phenomena—it's an esthetic wonder as well. Even the pocket-protector gang at The Why Files can't ignore the beauty that is snow. What are those strange squeaks, those mysterious flashes of light and weird haloes around the sun? A magnificent halo. The fellow in the center blocks the sun for the camera. The two parahelions are formed by plate-shaped ice crystals. The 22-degree halo is formed by column-shaped crystals. The upper tangent arc and parahelic circle are made by precisely-aligned column crystals. Courtesy NOAA. reflected, bouncing back (like a mirror) or being scattered. Reflection, which occurs at an object's outer boundary, allows us to see objects that don't emit light. Flat, new snowflakes reflect part of the sun's image toward your eye; each "sparkle" comes from an individual crystal facet, which acts like a tiny mirror. We only see the sparkle when the angle between the sun, crystal facet, and eye is perfect. But because snow has so many crystal facets, as soon as we move, other facets reflect new sparkles. Why do we see haloes around the sun or moon? Halos and other optical effects can be caused by transmission or reflection. 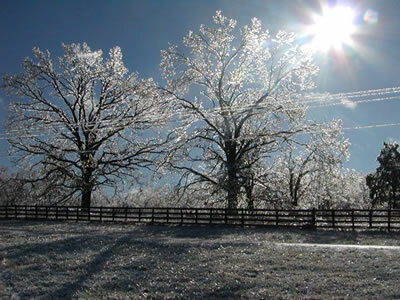 They occur when ice crystals bend light, which then appears at an angle to the sun. As you can see from the photo, different types of ice crystals—and different orientations in the atmosphere—cause different optical effects. Because airborne ice can bend light anywhere in the atmosphere, in cold regions you may see halos near the ground. A similar phenomenon causes rainbows—water droplets in the air refract (bend) light, causing a rainbow in the sky opposite the sun. In rainbows, as in some haloes, the light is broken into its components, so you see the "colors of the rainbow." 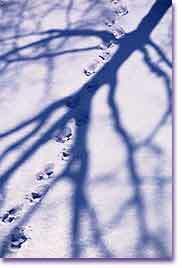 Why does fresh snow squeak and squawk when you step on it? You're hearing the death throes of ice crystals. The reason that crystals are only crushed in cold weather stems from the fact that water's freezing point, like its boiling point, changes with pressure. When pressure rises, the boiling point rises and the freezing point drops. When you walk on snow, your boots apply pressure. If the snow is warmer than about 14 degrees F (-10 degrees C), the pressure partly melts the snow, which "flows" under your boot instead of breaking. If the snow is colder, it does not melt, and your boot crushes those innocent ice crystals, accounting for that plaintive scrunching sound. Similarly, ice skating and skiing both depend on pressure from the skate or ski, which melts a thin layer of ice or snow, causing a thin, low-friction film of water. 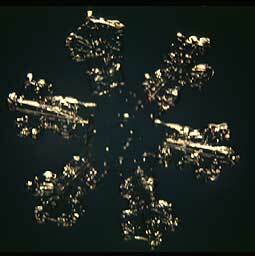 Seen up close and personal, this snowflake demonstrates how the facets of a crystal reflect light. © Pao-Kuan Wang. Why is snow silent? Stop crushing defenseless snow crystals under those jackboots for a moment and enjoy the wondrous silence of a snowfall. Braying asses, bleating lambs, even bellowing football fans all fade away in a heavy snowfall. Reminds us of a Jodie Foster movie: The silence of the fans. The silence stems from the failure of some snow crystals to reflect sound waves. In fact, the huge number of randomly aligned surfaces on a sheet of fresh snow resembles the acoustic baffles used to achieve silence in recording studios. Logically, soft, dendritic snowflakes are better at dampening sound than more compact crystals—the increased number of surfaces breaks sound waves into smaller parts. As snow packs down, it gets denser, and the cacophony of modern life resumes. Get snowed under our frozen water bibliography. There are 1 2 3 4 5 pages in this feature plus a bibliography.